Another example of an “Outdoor Trail” lesson plan, with a fun “branch”. 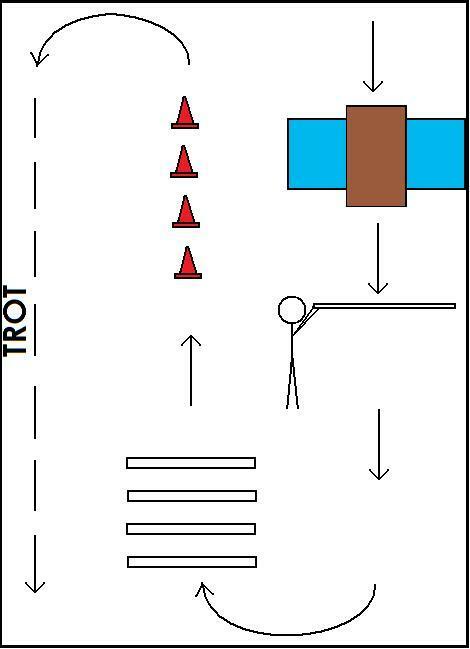 Desensitize the horses to walking over a bridge over a blue tarp (“water”). Desensitize the horses to walking under a thin pole (“branch”) – it touching all parts of their body, sliding down their neck, bumping their rear, falling on the ground, etc. Branches – as walking, ask “What would you do if you came to a low branch on the trail, duck or lean back?” Let them answer. Explain that ducking is the best option because if you lean back, your chin could get caught. Have everyone come to the middle and woah, and teach them how to duck onto their horse’s back without coming out of the saddle and tucking their head. Explain Pattern – Today we are working on obstacles you might find on an Outdoor Trail. First verbally: 1) walk over the bridge over water; 2) walk under the “branch”, 3) 2 point over the “logs”, 4) weave the cones, imagine it’s a “very narrow trail around trees”; 5) trot the long wall. Practice Pattern 3x – Send them off one after another. Give hints, corrections, and praises. Such as let your horse look at the bridge if he needs to but urge him on over it; duck when you’re 3 feet from the branch so you don’t lose your vision for a long time until you reach it; squeeze your horse to encourage him to pick his feet up over the “logs”; and so on. Progression Options: A) when they’re ducking well, teach them an alternative way to pass the branch – instead of ducking, put the reins in one hand and with the other pick the branch up and pass it over your head; B) progress to leader 3 ft away, to no leader; C) progress to trotting over the logs and through the cones; D) each round put the “branch” lower; etc. Demonstrate woah, walk on, and steering with correct hand position 90% of the time, with leader, no prompts. Perform two point in the correct position 100% of the time at the trot over 4 poles, no leader, minimal prompts. Perform a 4 step obstacle course 3/3 times, leader 3 feet away, no prompts. The “branch” is so fun! Use a thin light PVC pipe or flexible pole of some sort – even a pool noodle will work. Hold it in the air like a branch for the kids to ride under to learn to duck under a branch! Play “How Low Can You Go?” Each round lower the branch a bit so by the end they are ducking low on their horse’s neck – so low the pole moves down their horse’s neck, bumping their helmet and back, like a real branch would. You can even make the branch get “stuck” on their shoulder for a few seconds! When the branch gets too low for them to duck under, make it get stuck on their helmet. Have them sit up and figure out what other options they could do, such as hold the reins in one hand and with the other move the branch up and over their head, focusing on how to coordinate your hands to do this. You can also have the branch be angled and teach them how to pick the best spot to go under the branch. Be creative! There are so many things you can do with one “branch”!